I recently found out the story behind the building, and naming, of Bog Inn Hut after a phone conversation with one of the original builders—Doug Widdowson—one of 6 men who built the hut. 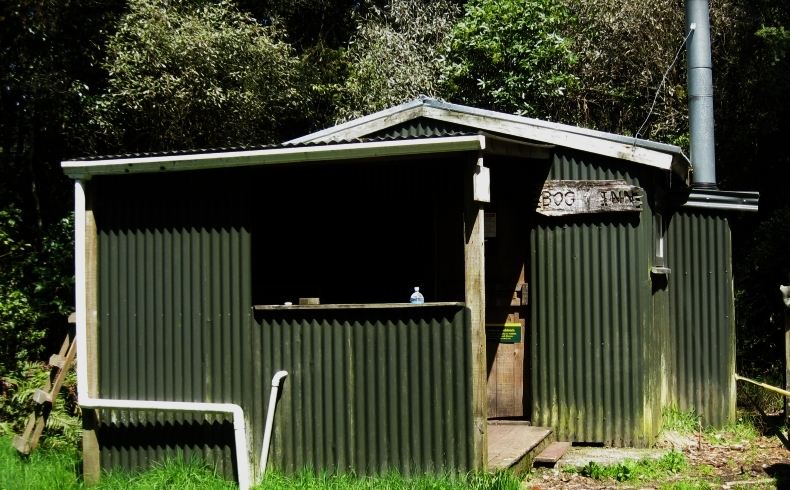 Bog Inn Hut was built in 1960 specifically to make it easier to establish and measure indigenous forest regrowth in Pureora Forest. 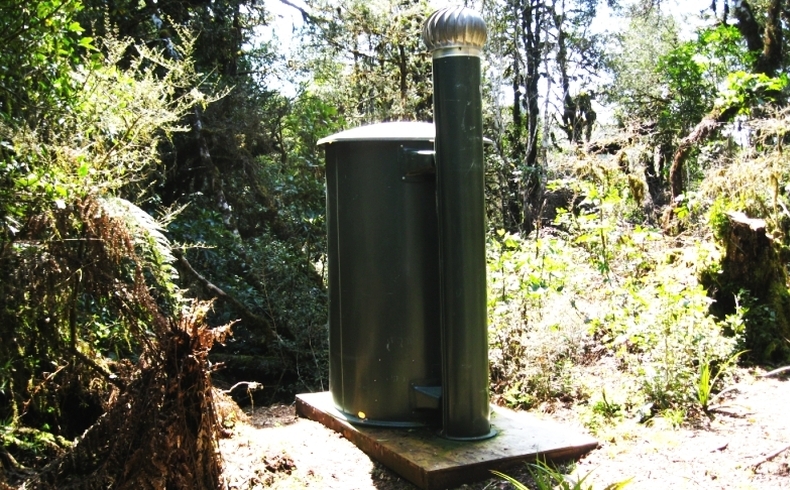 The project was headed by Peter McKelvey and John Nichols from the New Zealand Forest Service. At the time Doug was employed as a ranger. They built the hut from split mountain totara. It took the men about 10 working days. The flat roofing iron was rolled up and, along with nails and fittings, was air dropped in beside the swamp. Doug said the roofing rolls were very heavy and most of them ended up half buried in the swamp and took some digging out. The window glass was carried in. The hut was sited next to ‘Ongarue swamp’ because they planned to establish 10 new forest plots in the vicinity. The name ‘Bog Inn’ was coined by the builders because of its proximity to the swamp. When they completed the hut, they wrote ‘Bog Inn’ on a piece of roofing iron, signed their names, and put it under the mantelpiece. The men then cut a track along a ridge and down to the Waihaha River where they built the Waihaha Hut, which later burned down. 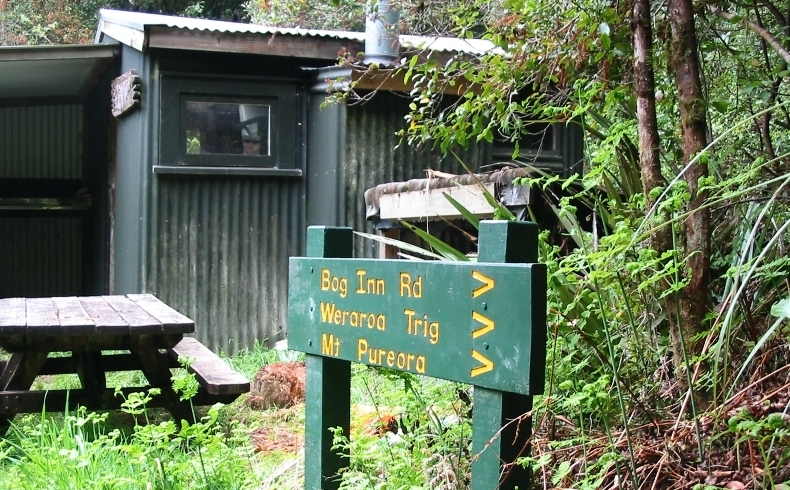 Bog Inn Hut still stands proudly today, sitting at the foot of Mt Pureora, it provides trampers and hunters with a rustic overnight stay in the Pureora Forest Park. The interior of the hut remains largely original retaining its unique character. I’m sure all the huts would have some great stories to tell. NZ history is a wonderful thing and something we need to treasure. Check out the books “Shelter From the Storm” by Barnett, Brown, and Spearpoint or “Huts: Untold Stories from Backcountry New Zealand” by Mark Pickering for more great stories. Both excellent books.